Our company is one of the premier providers of armed guards and unarmed guards in Fort Lauderdale, Florida. We have over 25 years of experience in this business, and over that time we have always placed an emphasis on team building. The security guards that we have on our staff are all highly qualified, reliable, experienced professionals. We provide top-quality armed guards and unarmed guards, but we keep our services surprisingly affordable. Special event security is one of our specialties, and we can dispatch unarmed guards or armed guards for events of all kinds. We can provide security guards for parties, weddings, and other smaller gatherings. On the other side of the spectrum, our Fort Lauderdale special event security services can be expanded to handle large gatherings like concerts, sporting events, carnivals, conventions, political rallies, etc. As a comprehensive Fort Lauderdale, FL security company, we also provide armed guards for personal protection purposes. This is a sensitive area, and we take it very seriously. When you are protecting popular musicians, actors, professional athletes, corporate executives, dignitaries, and other recognizable individuals, the stakes are high. Most of the armed guards on our staff are from military and/or police backgrounds. These are people who are used to handling potentially volatile situations, and they are highly trained and experienced professionals. Our Ft. Lauderdale security guards can react to situations that arise spontaneously, but we also do our homework to minimize risks. When we provide personal protection for a high-profile individual, we take every detail into consideration. We do our research and implement the appropriate logistic strategies to keep our clients safe and sound. 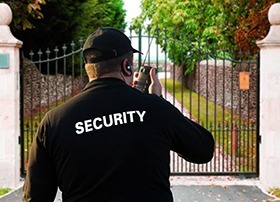 We can be relied on to provide reliable, effective security guards if you are in need of a security patrol on an ongoing basis, or a limited basis. As a local Fort Lauderdale, Florida security company we have a thorough understanding of the needs of people in our area. If you need security patrol services for a retail environment, a construction site, an apartment complex, or any other environment, we can satisfy your needs and exceed your expectations.